Very well presented four bedroom detached family home offering ample living accommodation for a family. Located in the popular village of Rough Close offering a range of local amenities. The location of the property also offers good access to the market town of Stone providing a wide range of local amenities and facilities including shops, restaurants, supermarkets and stunning local marina and Stone Railway Station. Further afield the towns Of Stafford and Stoke are also within driving distance both offering a wide range of shops, museums, and the M6 motorway. 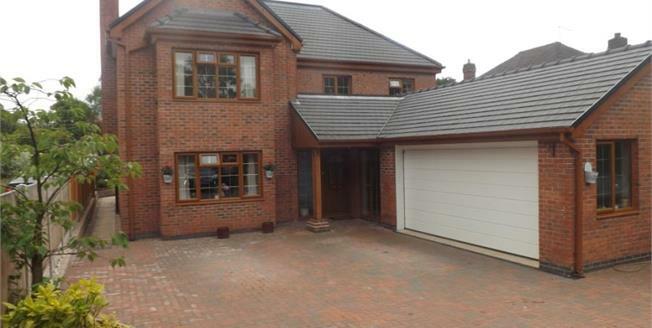 Property comprises of lounge, kitchen/diner, utility, orangery, office, study, downstairs WC. To the first floor there are four bedrooms with master and bedroom two benefiting from an en-suite and family bathroom. Outside the property there are enclosed gardens to the front and rear and double garage. This is a truly special property, with viewing highly recommended to appreciate all this fabulous family home. UPVC front double glazed door. Double glazed uPVC window with frosted glass facing the front and side. Radiator, engineered wood flooring, recessed lighting. Loft access . Double glazed uPVC window with frosted glass facing the side. Heated towel rail, tiled flooring, recessed lighting. Low level WC, semi-pedestal sink. Double glazed uPVC window with frosted glass facing the side. Double glazed window to side. Radiator, engineered wood flooring, recessed lighting. Double glazed uPVC box bay window facing the front. Radiator and wood burner, engineered wood flooring, recessed lighting. Wooden bi-fold glazed door to orangery. Doors to rooms. Double glazed uPVC window to side. Double glazed window to rear. Radiator, tiled and engineered wood flooring, recessed lighting and ceiling light. Granite work surface, range of fitted wall and base units, double belfast sink with mixer tap, space for appliances. UPVC back double glazed door. Double glazed uPVC window facing the rear. Radiator, tiled flooring, tiled splashbacks, recessed lighting. Wood work surface, belfast style sink, space for appliances. uPVC French double glazed door, opening onto the patio. Double glazed uPVC window facing the rear and side. Radiator, engineered wood flooring, vaulted ceiling, recessed lighting. Double glazed uPVC window with frosted glass facing the side. Radiator, engineered wood flooring, recessed lighting. Loft access . Double glazed uPVC window facing the front. Radiator, ceiling light. Double glazed uPVC box bay window facing the front. Radiator, a built-in wardrobe, recessed lighting. Double glazed uPVC window with frosted glass facing the side. Heated towel rail, tiled flooring, part tiled walls, recessed lighting. Low level WC, corner shower, vanity unit and wash hand basin. Double glazed uPVC skylight window facing the front. Radiator, recessed lighting. Double glazed uPVC window with frosted glass facing the rear. Heated towel rail, tiled flooring, part tiled walls, recessed lighting. Low level WC, corner shower, vanity unit and wash hand basin. Double glazed uPVC window facing the rear. Radiator, recessed lighting. Double glazed uPVC window with frosted glass facing the rear. Heated towel rail, tiled flooring, part tiled walls, recessed lighting. Concealed cistern WC, spa bath with mixer tap, corner shower, vanity unit and wash hand basin with mixer tap. Garage . Double glazed uPVC window with frosted glass facing the front. The front garden is accessed via two gates leading to a block paved driveway providing ample parking for several vehicles. Flower borders with well established plants and shrubs. To the rear there is a good sized garden with extensive paved patio area leading to garden mainly laid to lawn and flower borders. Enclosed on all side by wood fencing and hedgerow.